San Diego, CA February 13th, IDW Games, Steve Jackson Games, and Nickelodeon Consumer Products are excited to announce Munchkin Teenage Mutant Ninja Turtles. This collaboration brings the mega-hit Munchkin card game series to the next level. Players take on the roles of the Turtles and their friends to fight monsters and grab treasure. The card game will be available in standard, deluxe, and deluxe ultimate formats and features all-new art from iconic Teenage Mutant Ninja Turtles co-creator, Kevin Eastman, along with artist Tadd Galusha, and gameplay developed by designer Jon Cohn. Munchkin Teenage Mutant Ninja Turtles brings Steve Jackson Games and IDW Games together for an action-packed card game combining iconic characters from Nickelodeon’s Teenage Mutant Ninja Turtles universe with the engaging gameplay of the long-running Munchkin series. This latest version of Munchkin will be supported with a Kickstarter campaign set to launch at 11am PST on March 7th and will feature thrilling reveals and extras. Paired with unique and iconic art from Kevin Eastman, fans of the series will be able to enjoy the Teenage Mutant Ninja Turtles in a whole new way. 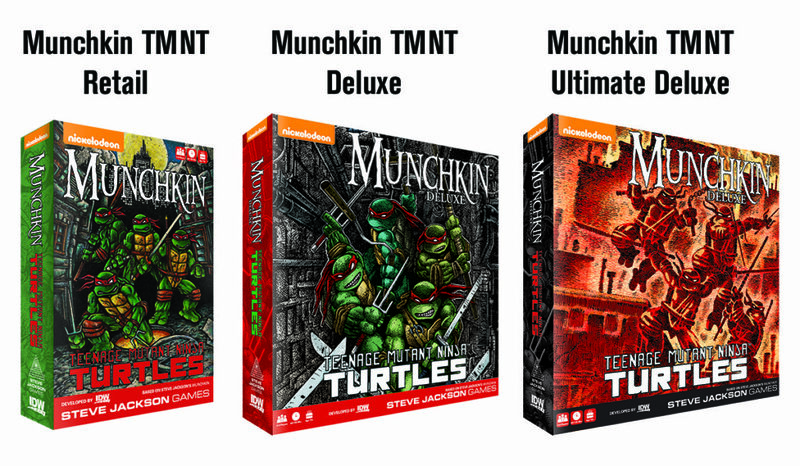 Along with the standard edition available at retail stores, Munchkin Teenage Mutant Ninja Turtles will also be released in two special editions only available through the Kickstarter campaign, a Deluxe Edition and a Deluxe Ultimate Edition. Each Deluxe Edition will feature character standees and a fully illustrated mounted Level tracker. The Deluxe Ultimate Edition will feature variant, retro-style coloring on all components that will be reminiscent of the original Teenage Mutant Ninja Turtles comics published over 30 years ago. Munchkin Teenage Mutant Ninja Turtles will be launching March 7th on Kickstarter with a $29.95 SRP for the Deluxe Editions. The standard edition will carry a $24.95 SRP and all editions are scheduled be available in June 2018. Steve Jackson Games, based in Austin, Texas, has been publishing games, game books and magazines since 1980. SJ Games recently released the Munchkin Collectible Card Game, based on its best-selling game Munchkin, which has over 9 million games and supplements in print worldwide. Other top sellers are Simon’s Cat Card Game, Zombie Dice and Illuminati. Past hits have included Car Wars and the GURPS roleplaying game system. Steve’s very first game, Ogre, originally published in 1977, has been recently released as a video game on the Steam platform, bringing a tabletop classic to a new generation of fans. ← Masque of the Red Death Pledge Manger Now Open!